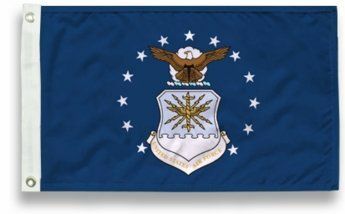 The flag of the United States Air Force consists of the coat of arms, 13 white stars and the Air Force Seal, on a blue background. The 13 stars represent the 13 original US colonies, while the three-star grouping at the top symbolizes cooperation between the Army, Navy, and Air Force. The crest includes the American bald eagle, the cloud formation depicts the creation of a new firmament, and the wreath, composed of six alternate folds of silver and blue, incorporates the colors of the basic shield design. 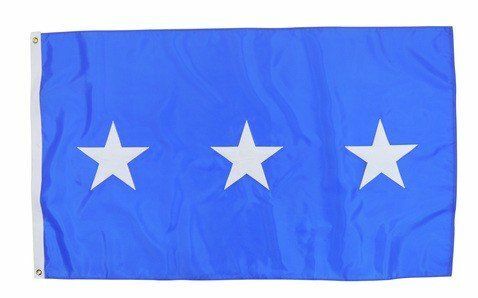 AmericanFlags.com features Air Force flags in two materials - military-grade nylon and standard polyester. 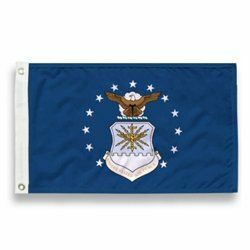 We offer Air Force flags for sale in a variety of sizes from 12" X 18" to 6' X 10'. 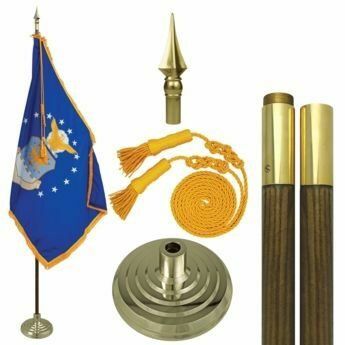 AmericanFlags.com also carries handheld Air Force flags, which are perfect for parades, ceremonies and other events.